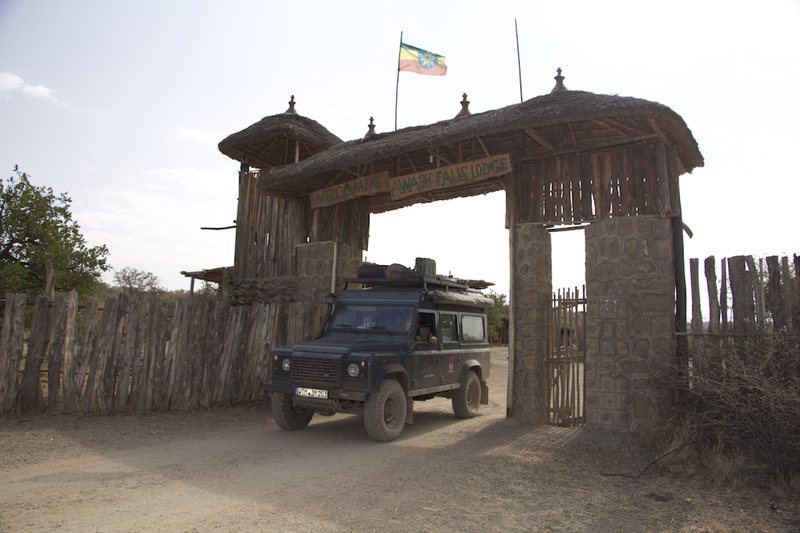 The Kenyan border post at Moyale ... so very friendly and welcoming! We avoided Addis Abeba, as for European citizens it is possible to get on-arrival visa at the border, and stayed in Awash National Park at the Awash Falls Lodge (N8° 50.574' E40° 00.753') overlooking the famous Awash Falls where you can watch the Nile crocodiles while you are having breakfast. There is a national park campsite about 300m away from the lodge (N8° 50.871' E40° 00.273'), which is a really nice camp in the bush - just beware of cheaky baboons! 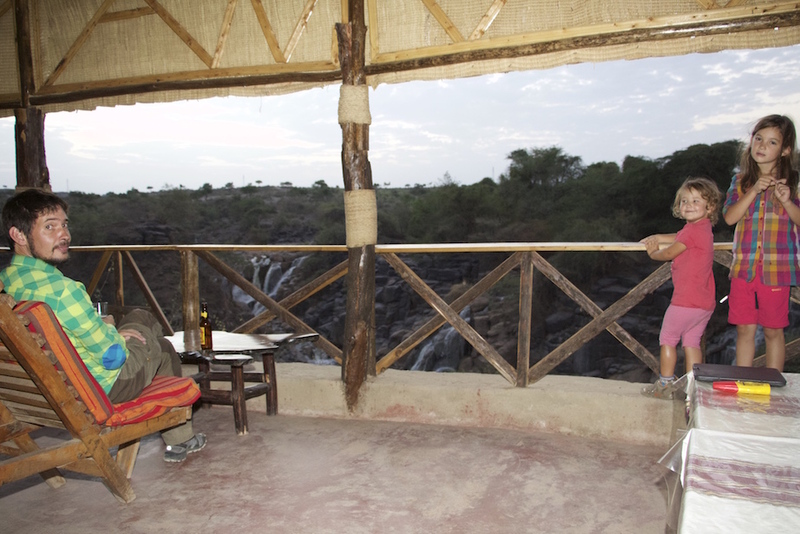 Awash Falls Lodge - a great place to stay! From Addis Abeba there are actually two parallel ways to reach the Ethiopian/Kenyan border town of Moyale about 1,000 km to the south: #1 The direct route via Shashemene, Hawassa (Awasa), Dila, Mega and finally Moyale and #2 the route which from Shashemene goes parallel to route #1 through Sodo, Arba Minch until it joins route #1 in Yabelo. Actually, we had expected the road to turn bad on the Kenyan side as the Moyale - Marsabit - Isiolo route had the reputation of being the most dangerous road in Africa for many years, we did not really check which route to take on the Ethiopian side. So we took route #1, which apparently was a mistake, as the roundabout 230km from Hawassa (Awasa) down to Surupa are the worst road we have so far encountered in all Africa, actually in all our travels. It is impossible to ravel this road with a normal car and in a 4x4 or truck it is really challenging ... the roundabout 500km from Shashemene to Moyale take between eleven and fourteen (!) hours and are a hard test for man and material. When we asked drivers working for local tourist agencies, they told us that route #2 is the better one which is even manageable to drive in a normal car or even camper van. This is our "room" ... gorgeous when normally you live with four people on roundabout six square meters! 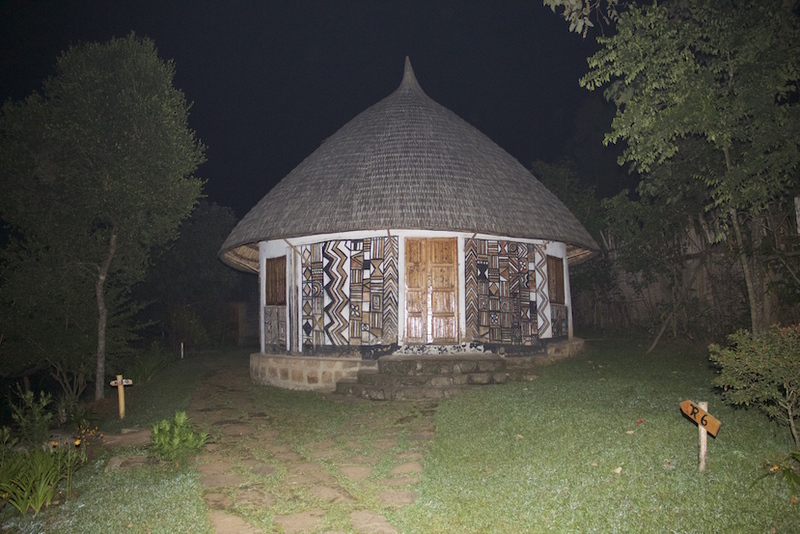 If you still decide on taking route #1, the "Aregash Lodge" (N6° 44.954' E38° 26.629') in Yirga Alem, owned by an Ethiopian/Greek/Italian family is a wonderful place to rest a while. 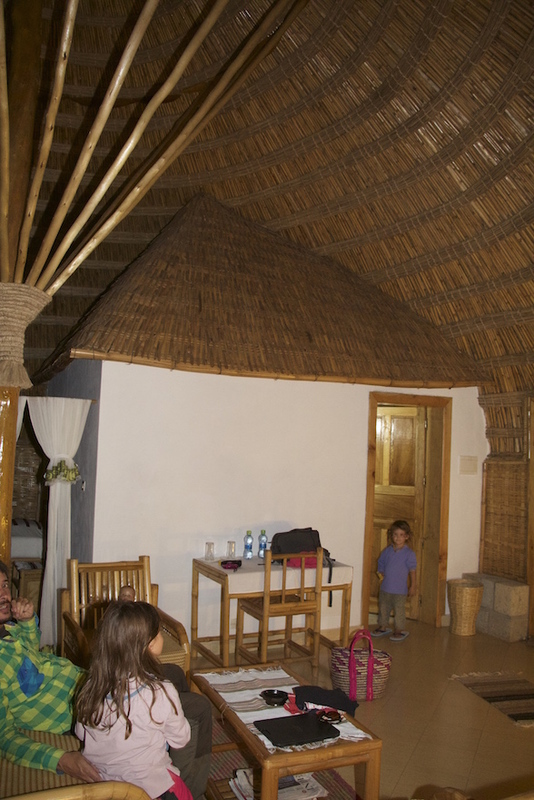 The lodge is a peaceful haven for the weary traveler and the bamboo thatched Tukuls simply are pure luxury and the prices (also negotionable!) are quite reasonable if you bear in mind the nearly European standard not to be seen too often here in Ethiopia. The food the on site restaurant prepares (both buffet and á la carte) is splendid and a good fusion between international and traditional Ethiopian recipies. After having experienced the road conditions on the Ethiopian side of the road between Addis and Nairobi, we did not really know what to expect on the Kenyan side. In Moyale (Ethiopian side), the "best" place to stay for one night is the Koket Borena Hotel in Moyale (N3° 32.678' E39° 02.909') which has a walled courtyard where your car is safely parked. Rooms are cheap (around 500Birr, about 23€) but the standard is rather low and nobody speaks proper English. The border procedures are easy (coming from the north: first go to immigration, then to customs on the Ethiopian side and check in with the police first, then go to immigration and then have your Carnet stamped at customs on the Kenyan side) and there is absolutely no hassle by any "agents" or "fixers" of the kind every traveller in Africa just "likes"! All officials we met both on the Ethiopian and Kenyan side are really friendly and helpful. On the Ethiopian side immigration opens at 7:00 in the morning and customs at 8:00 (counter three, if that one is not occupied you have got to ask at one of the other counters, if you don't ask, it might be that nobody serves you in a long time!). On the Kenyan side (when traveling southbound), make sure that you get an East African Visa which is valid for Kenya, Uganda and Rwanda alltogether for three months and costs US$100 per person (needed documents: passports, no passport photos needed!). This way you save a lot of money, as the Kenyan visa is US$50, the Ugandan (as we heard) is US$100 and we are not sure about how much the visa for Rwanda are. This is supposed to be the worst road in Africa?!?!?! The supposed "worst road in Africa" is good and new tarmac for more than 80%. 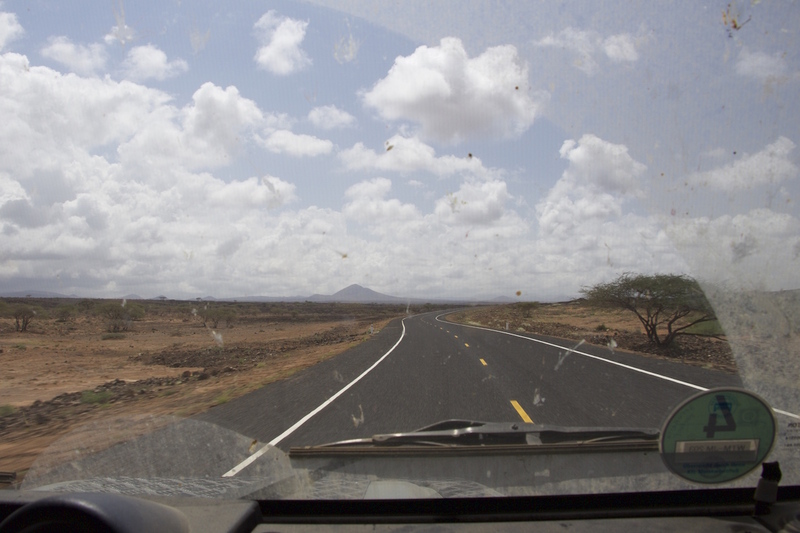 The remaining 20% (not more than 100km alltogether in two stretches between entering Marsabit and leaving the Marsabit National Park and in the complete Losai National Reserve plus detours around bridges under construction and a short stretch directly in Moyale after entering Kenya) are relatively good gravel or dirt road. The worst part actually is the road through the city centre of Masabit, which is deep mud in the middle but if the weather is relatively dry, you can go around most parts easily. The road was also famous for the bandits that raided unsuspecting tourists and trucks ... this time seems to be over as well! 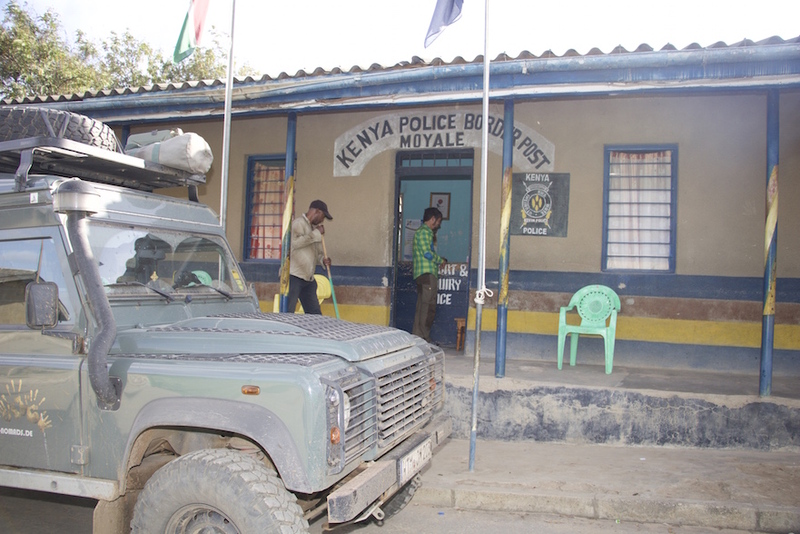 We felt very safe and secure and the Kenyan Army is taking care of security (some checkpoints but everybody is extremely friendly and welcoming). There is one good campsite in Marsabit, called Henry's Rest Camp (N 02° 20.739' E 037° 57.941') and another campsite in Isiolo, just in case it takes you longer due to rainy weather conditions. For the roundabout 800km from Moyale to Nairobi it took us about 12 hours. After Isiolo, it is no problem to drive at night as the road conditions are good. Only watch out for trucks (very slow on ascends! ), minibusses and the local buses which do not follow any traffic rules. In Nairobi, you can stay at "Jungle Junction" (S 01° 21.767' E 036° 44.438'), which is a safe, reasonable and very friendly overlander's camp with easy access to all conveniences of Nairobi shopping and sightseeing. Chris from Germany and Diane from Kenya are wonderful hosts, can help with almost anything and Chris is known to be a really good and thorough mechanic (especially so when it comes to motor cycles!). Their kids are simply lovely and great playmates for any travel children. Note that "JJs" have moved to "Karen" on the outskirts of Nairobi and many GPS navigation systems still seem to have the old address. This entry was posted in Africa Overland and tagged Borders, Ethiopia, Kenya, Visa on 25. December 2015 by Juliane und Mischa. I read what you blog here. What I feel is just to join you guys with my family. I like the way you live your life. That is not only important but necessary to achieve an established goal. Die Meyers wünschen euch ein frohes Weihnachtsfest so ganz im fernen Afrika! Für das kommende Jahr wünschen wir euch vor allem eine glückliche Hand bei der Weiterreise, Gesundheit und und ein wohlbehaltenes Ankommen auf Spiekeroog. Danke für euer so originelles Geschenk, welches deine Mutter Mischa bei uns eigenhändig vorbeigebracht hat. Der Kaffee schmeckt hervorragende! Leider waren wir nicht zuhause aber wir haben am nächsten Tag ausgiebig mit ihr telefoniert. Entschuldigt, dass wir uns so spät melden, aber ich hatte es mit dem Facebook Messenger probiert, da wird mir aber angezeigt, dass ihr meine Nachricht nicht zugestellt bekommt.